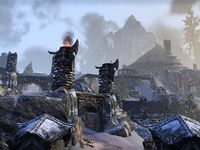 Fharun Stronghold is an Orc stronghold found along the coast in northern Wrothgar. It is the home of the Fharun Clan, led by Chief Bazrag, although the settlement is currently occupied by hostile Vosh Rakh forces. The collection item, Guthrag's Mask, can also be found here. This location first appeared in Arena as the city of Farrun. Though it is spelled differently everywhere in ESO, the book The Year 2920, Vol. 6 still retains this alternate spelling. Knarstygg also refers to the location as Farrun in conversation.